FORETOLD IN THE BIBLE: A mark on their right hand. No one may buy or sell. The mark of the beast. It’s not fiction. It’s prophecy. Author Bridgette L. Collins is definitely excited about her new literary project with Author Terry E. McGee Sr. 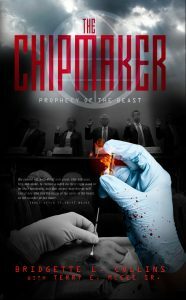 The Chip Maker: Prophecy of the Beast is definitely a thriller filled with drama and intrigue that stretches one’s imagination. Imagine? A mandatory RFID chip implanted into your right hand. Consider it like an expansion of the chip technology in your new debit/credit cards. This action oriented thriller will forever change the way you look at devices equipped with computer chips. Jim Natas has spent the last decade enhancing the functionality of radio frequency identification (RFID) technology to identify, track, and provide information on every living organism via an implantable chip. His concealed mission: The creation of one government, one religion, and one financial system, enabling him to control the world. Natas partners with Global Media Sources, the world’s largest media and entertainment conglomerate, to establish a real-time, adaptive communications infrastructure to orient the implantable chip to the world. Recognizing the need for influential support, David Denmart, chairman and CEO of Global Media Sources, and his executive team recruits religious officials, political leaders, and notably famed entertainers to use their community and social media platforms to endorse, support, and persuade people to get chipped. The executive team plans for a widespread movement using various platforms to ignite fear and create chaos. Religious, political, and social warfare between chip supporters and protesters intensifies with the execution of targeted suicide bombings, plane crashes, civilian attacks, kidnappings, and assassinations. It’s the summer of 2021 and Natas’ goal is to have every human being, 7.8 billion, chipped by August 2021. The choice to accept or reject the implantable chip, today’s modern-day beast, becomes the greatest test for mankind. This book is intended to inspire others to focus their thoughts, feelings, and actions on life after death. The loud and clear message inside “The Chip Maker: Prophecy of the Beast” will provoke the reader to assess the current path of their lives in preparation of life after death. The characters were created as the writers mapped out chain of events signifying Jesus Christ’s second coming. Of the characters created for the story line fifty percent are believers and the other fifty percent are non-believers. Based on biblical scripture, “He causes all, both small and great, rich and poor, free and slave, to receive a mark on their right hand or on their foreheads, and that no one may buy or sell except one who has the mark or the name of the beast, or the number of his name. (Revelation 13:16-17 NKJV)”, the believers who are all from a diverse backgrounds will die before they accept the mandatory RFID chip. “Other planned attacks are underway for this weekend at a couple of the remaining pre-season football games, jazz festivals, end of summer festivities, and back to school events. The hurricane brewing in the Gulf should also generate a number of deaths. People won’t know if their family members and friends are alive or dead. More fear to get chipped,” Larry said as he nodded with assurance. “And our new administration’s help with perpetuating the overseas wars has helped generate a lot of civilian and military deaths — not to mention our foreign partners’ threat of nuclear weapons ready to be launched. All well worth the two trillion dollars we’ve contributed on several fronts,” Mr. Meyers said. “Definitely so, sir,” Larry responded. The Pledge had become Global Media Sources’ signature campaign for gaining visibility and promoting the My Access Chip as a necessary device. The goal was to get people to show their support for the chip by taking the pledge and agreeing to acquire the implantable chip. On the surface, the campaign was the Organizers’ (an elite group of chip supporters and promoters) way of instilling in individuals the idea of necessary identification, easy access living, and safety. “And for individuals receiving governmental assistance, the mandatory requirement for them to get chipped as a part of being compliant with the continuing receipt of their benefits has been monumental,” Larry said. The requirement was part of a greater movement working behind the scenes. Larry’s wife, mother-in-law, and three kids, ages five, ten, and twelve, had been missing for two months. “She still hasn’t tried to contact your pastor or any of your church members?” Sam asked. Practicing his swing back and forth, Mr. Meyers let out a soft “Hmm.” His movements were slow and edgy. As the impact of the disappearance sank in, Larry and Sam turned to stare at each other. They reeked of a probing anxiety. “I know, sir.” Larry breathed in deeply and nodded. “Bless you, sir,” Larry said quickly. “Bless you, sir,” Sam interjected. Larry hurriedly placed his golf ball on the rubber tee as Sam looked down at his handheld GPS. “Why is it so hard for our top-notch security team to find a woman, three kids, and a demented old lady?” Mr. Meyers snapped, staring at Sam. He was frustrated that such a dangerous loose end existed, one that potentially had access to secret information. Sam placed his GPS device in his bag and looked at the parade of cars entering and exiting the golf center building. “Well?” Mr. Meyers said, glaring at Sam with contempt. “Sam, I want to hear your solution!” demanded Mr. Meyers. “We’re on it, Boss,” Sam replied swiftly. “A better question would be, how can I be sure about the proficiency of our next actions?” Mr. Meyers snapped. “Yes, we still have significant ground to cover. We haven’t met our goal,” Mr. Meyers retorted. “The support of the new White House administration has been very helpful,” Larry added. “The benefits and requirements of the free government programs will continue to be a key factor in boosting the numbers,” Sam chimed in. “Yes, many people have taken advantage of the free Education Program, Small Business Program, Social Security Disability Program, and other programs. But we haven’t met our goal,” Mr. Meyers reiterated. “Sir, with a coalition of domestic and international attacks scheduled, I guarantee you we’ll meet our goal by the end of this month,” Larry promised. “Today is August 21st!” Mr. Meyers shouted. Sam quickly redirected Mr. Meyers’ attention to their golf game. As Larry began to line up his shot, the cloudy blue skies suddenly turned to darkness. The men then heard the deafening sound of a trumpet as the earth underneath them started to tremble. “What’s happening?” Larry shouted, sounding like a scared child. “Run!” Mr. Meyers shouted with panic. “Everyone, drop down and cover your head and neck with your hands and arms,” Sam said. Dust filled the air while the men proceeded to fall to the ground on their hands and knees. Others on the course started to run hysterically across the shaking, manicured lawn, heading toward the golf club center, but they fell to the ground before reaching the building. “It’s probably just some seismic activity!” Sam shouted as he placed his hand on Mr. Meyers’ shoulder. Seconds later, cars were trying to speed out of the country club’s parking lot. People were screaming, tires were screeching, and cars were swiftly caught up in a traffic jam above the shaking earth. Larry, Mr. Meyers, and Sam raised their heads as the scene unfolded in front of them and the disturbing commotion became increasingly bizarre: before their eyes, people around them started to vanish.